An unusually complex design was utilized on this project to provide ground and first-floor carton-live picking systems using rack supported walkways. This client required a specially designed cardboard storage container to be used within the live storage, enabling them to tear off the front of each active box location, without the remaining volumes falling out when knocked from behind by spare stock boxes. 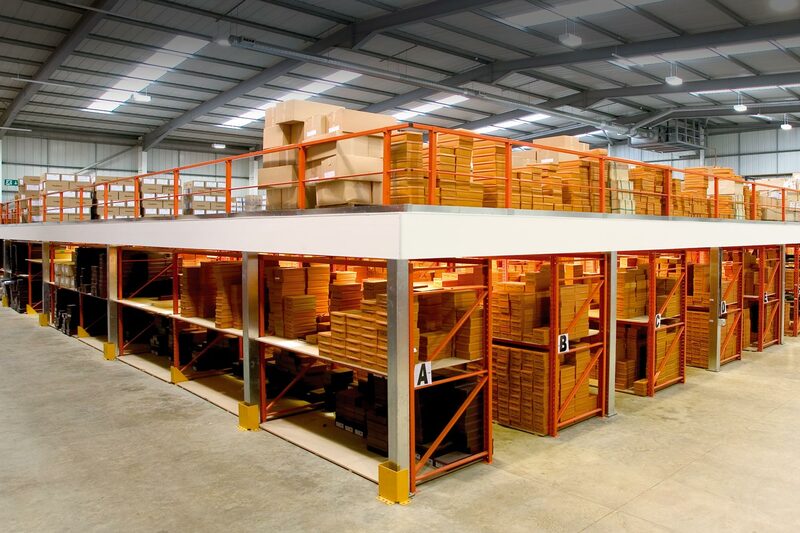 At one end of the main picking aisles, an interfloor lift was incorporated into the layout; this enabled a complete order trolley to be transferred to ground floor for processing. A recessed pit had to be created in the floor slab to allow the lift to be installed. Oakway also undertook to provide this service as part of the contract; all activity had to be carefully monitored, cordoned off and dust controlled to ensure that the clients existing installations were not damaged from the building works. Access to the first floor picking locations is via an in-rack staircase as pictured.